The Reception of Epigenetics: More like Mendel or Darwin? My name is Shea Robison. As is well known, Darwin’s theory of evolution presented fundamental challenges to many of the prevailing core beliefs and values of the mid-1800s. These fundamental ontological challenges account for the significant scientific and ecclesiastical opposition which greeted the publication of On the Origin of Species by Means of Natural Selection. Similarly, the foundations of modern genetics which emerged in the early 20th century also presented scientific, political and ethical challenges of its own. I assert that contemporary epigenetics likewise presents equally fundamental challenges to the prevailing politics and ethics of our time, but with a twist. Thus, the differences in scientific understandings of biology presented by each of these ‘advances’ in science present equally important political and ethical implications. To this end, there are important differences in the circumstances of the emergence of each of these significant changes in the prevailing understanding of biology, and in their commensurate impacts on the prevailing politics and ethics, and in the impacts of these prevailing politics and ethics on these changes in biology. In particular, while Darwin’s theory provoked—and still provokes—considerable opposition, as do epigenetics, the reception of the modern theory of genetics has been remarkably smooth. For many, this is merely evidence of the self-evident ‘rightness’ of genetics. However, the history and recent (re)emergence of epigenetics suggests that ease of acceptance is not necessarily the sine qua non of scientific validity. Elaborating these differences in reception between Darwinian evolution, genetics and epigenetics is an important step in predicting what could be the political and ethical impacts of epigenetics today and in the future. Even before the publication of Origin in 1859, the reactions to Darwin’s ideas were immediate, international and intense. As evidenced by the Scopes trial in 1921, the religious reactions against Darwinian evolution were still boiling over sixty years after the publication of Origin, and these reactions against the implications of Darwinian evolution continue to the present day in the ongoing debates over the teaching of evolution in public schools. As described by the American philosopher John Dewey in his 1910 essay on the influence of Darwin, “the ‘Origin of Species’ introduced a mode of thinking that in the end was bound to transform the logic of knowledge, and hence the treatment of morals, politics, and religion” And this has clearly been the case. Notably, though, few of these reactions against Darwinian evolution also include opposition to genetics; instead, Darwinian evolution is usually the sole focus of these ideology-based critiques (i.e., how many school boards have banned the teaching of genetics on religious grounds?). In fact, if the available evidence supports any conclusion, that conclusion is that genetics is also compatible with the basic assumptions of Christianity. Given the extent to which modern Western society is a product of the history of Christianity only provides further support for a fundamental congruency between genetics and the political and ethical assumptions of modern Western liberalism . To wit, some of the most strident opposition to Darwin’s theory came from the ecclesiastical perspective, including ecclesiastically-affiliated scientists. For example, Adam Sedgwick, one of the founders of modern geology and one of Darwin’s early instructors, after reading an advance copy of Origin wrote that the “point blank issue” that Darwin and his theory deny—but which is actually the “crown & glory” of organic philosophy—is that “there is a moral or metaphysical part of nature as well as a physical.” “You,” Sedgwick writes to Darwin, “have ignored this link; &, if I do not mistake your meaning, you have done your best in one or two pregnant cases to break it.” The repercussions of breaking this link as Darwin proposes, which Sedgwick first thanks God is not possible, is that humanity “would suffer a damage that might brutalize it—& sink the human race into a lower grade of degradation than any into which it has fallen since its written records tell us of its history”. These comments from Sedgwick provide just one example of the well-known negative reactions to Darwin’s theory , most of which revolve less around the science and—per the guiding model of my project in Figure 1—are more concerned with the political and ethical implications of Darwin’s theory of biology. However, the emergence of modern genetics—which is itself a synthesis of Mendelian genetics with Darwinian natural selection—with its emphasis on genes as the carriers of biological essences and of evolution as a gene-focused process generated new causal narratives which differed significantly from what were the prevailing narratives of the early 20th century. An important point of departure, though, is that while the Modern Synthesis did present some significant challenges to the political and ethical conventions of the early 20th century, it did not provoke the same reactions as Darwinian evolution. In fact, I have been hard-pressed to find any evidence of the kinds of censorious reactions against genetics like those of Sedgwick cited before. The best explanation I can give for this marked lack of reaction, per the relationships diagrammed in Figure 1, is that the assumptions of the science of genetics were already more or less congruent with the assumptions of the prevailing politics and ethics. This congruence facilitated the acceptance and propagation of the Modern Synthesis beyond the weight of the scientific evidence in its favor, which was not as overwhelming in its favor as it now seems in hindsight. In fact, one tantalizing possibility suggested by Figure 1 is that one of the reasons for the sudden acceptance of the synthesis of Mendelian genetics with Darwinian evolution—which until then had been competing explanations—was because it allowed just such a reconciliation of the science with the politics and ethics. In contrast, I assert that the ontological assumptions of contemporary epigenetics represent a fundamental break from the basic ontological commitments which inform contemporary society, similar to those presented by Darwinian natural selection. In this context, the position of epigenetics vis-à-vis the prevailing politics and ethics of contemporary society is likely much more similar to that of Darwinian evolution in the 1860s than of the emerging science of genetics in the early 1900s. While there may have been some resistance to genetics on political (i.e., ideological) and ethical (e.g., religious) grounds in the early 20th century, genetics produced nowhere near the antagonistic response to Darwinian evolution in the 1800s or epigenetics today—at least in the West. As has been discussed elsewhere, the reception of genetics in the Soviet Union, while initially quite positive, quite suddenly turned negative and for openly ideological reasons. In the West, though, with the possible exception of France , genetics has enjoyed a somewhat charmed life, moving quite rapidly from disputed scientific hypothesis to almost universally accepted convention. Again, the operative question is why genetics has trod a much smoother path even than its counterpart in the Modern Synthesis, the Darwinian theory of evolution by natural selection? And then what do these differences in reception say about the rocky history of epigenetics and about the prospects for epigenetics in the future? According to the guiding model of this project, for epigenetics to become widely accepted and to exert an influence on public policies there must be an eventual even if uneasy reconciliation between the science of epigenetics and the prevailing ethics and politics. This reconciliation must occur either through modifications of the politics and ethics to become more congruent with the innovations introduced by epigenetics, or through modifications of the science of epigenetics to become more congruent with the politics and ethics, or through some homeodynamic adjustments of all three components. We have the benefit of hindsight as to how this dynamic has already played out in regards to both Darwinian evolution and the Modern Synthesis with the politics and ethics of their time; the outcome of this dynamic in regards to epigenetics remains to be seen. 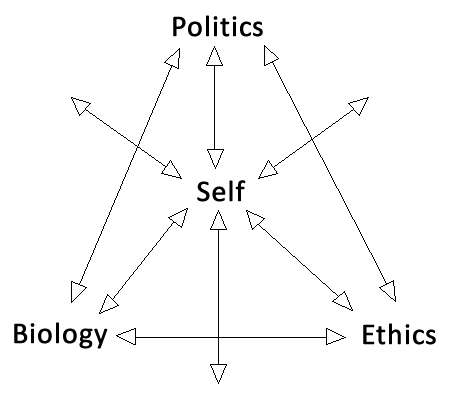 In the context of this history and the relationships revealed by Figure 1, there are at least three potential avenues that can be taken at this point: That contemporary politics and ethics are already changing to be congruent with these novel assumptions introduced by epigenetics; that these contemporary politics and ethics are not changing and will not change as needed to become congruent with epigenetics; or that epigenetics and the prevailing politics and ethics will all change together so as to become congruent with each other. In the first case, as the politics and ethics continue to change the science of epigenetics will be increasingly incorporated into contemporary politics. In the second case, the science of epigenetics will be increasingly hounded to the brink of irrelevance or extinction—as epigenetics had been until relatively recent. In the third case, some of the aspects of epigenetics which contradict these prevailing ethics and politics will be modified to conform while some of the other aspects of the politics and ethics which contradict the findings of epigenetics will likewise be modified to conform to epigenetics, though what these homeodynamic changes might be is difficult to predict at this point. At this early stage in the (re)emergence of epigenetics, any of these outcomes is plausible. Regardless, just as the narratives of evolution and genetics from the Modern Synthesis began to influence public policies in distinct ways even before the codification of the Modern Synthesis, e.g., the influential eugenics movements of the early 20th century , so also may the emerging narratives of epigenetics already be introducing unanticipated wrinkles into contemporary public policy discussions. Thus, one focus of my project–as discussed here in regards to the policy narratives of obesity–is to empirically analyze the implications for policy of these new challenges from epigenetics via the emerging narratives of epigenetics, as compared to the conventional narratives of obesity in particular. As such this project constitutes an important early point of reference for future discussions of the state of epigenetics, and of its political and ethical implications. I am curious to hear your thoughts. Are there important similarities between the receptions of Darwinian natural selection and epigenetics? Leave your comments below and I will respond. Dewey, John. 1910. “The Influence of Darwin on Philosophy.” In The Influence of Darwin on Philosophy, and Other Essays in Contemporary Thought. New York: Henry Holt and Company. Branch, Glenn. 2013. “Bad Science: Genetics as Misread by Creationism.” GeneWatch 26(4). http://www.councilforresponsiblegenetics.org/genewatch/GeneWatchPage.aspx?pageId=504 (May 6, 2015); Lester, Lane P. 1995. Genetics: Enemy of Evolution. Creation Research Quarterly 31(4); Lester, L. P. (1998). Genetics: No friend of evolution. Creation Ex Nihilo, 20(2), 22.; Moore, J. A. (2002). From Genesis to genetics: the case of evolution and creationism. Univ of California Press; Moore, J. A. (2002). From Genesis to genetics: the case of evolution and creationism. Univ of California Press; Morris, J. 2000. Why Can’t Geneticists See the Obvious Evidence for Creation in the Genetic Code? Acts & Facts. 29 (10). Hannam, J. (2011). The Genesis of Science: How the Christian Middle Ages Launched the Scientific Revolution. Regnery Publishing; Moritz, J. M. (2012). The War that Never Was: Exploding the Myth of the Historical Conflict Between Christianity and Science. Theology and Science,10(2), 113-123; Stark, R. (2014). How the west won: The neglected story of the triumph of modernity. Open Road Media; White Jr, L. (1967). 4. The Historical Roots of Our Ecologic Crisis. Science, 155(3767), 1203-1207. Sedgwick, Adam. 1859. Adam Sedgwick to Charles Darwin, November 25. In Darwin Correspondence Project. https://www.darwinproject.ac.uk/letter/entry-2548. Desmond, A. J. and James Richard Moore. (1994). Darwin. WW Norton & Company. Gayon, J., & Burian, R. M. (2004). National traditions and the emergence of genetics: the French example.Nature Reviews Genetics, 5(2), 150-156. Adams, M. B. (ed.). 1990. The Wellborn Science: Eugenics in Germany, France, Brazil, and Russia. New York: Oxford Univ. Press; Harper, P. S. (1992). Huntington disease and the abuse of genetics. American journal of human genetics, 50(3), 460; Scales-Trent, J. (2001). Racial purity laws in the United States and Nazi Germany: The targeting process. Human Rights Quarterly, 23(2), 260-307; Sofair, A. N., & Kaldjian, L. C. (2000). Eugenic sterilization and a qualified Nazi analogy: the United States and Germany, 1930-1945. Annals of internal medicine, 132(4), 312-319.